Drought is a reduction in precipitation over an extended period. This rain shortfall creates a water shortage which damages crops, livestock, and other human activities. A drought has both direct and indirect impacts. It directly reduces farmers' crops. It indirectly causes job and business losses in the farmers’ communities and around the world. The definition of drought varies from place to place. For example, only six days without rain is a drought in Bali. Since drought differs so much from place to place, there is no absolute figure that defines a drought. Instead, scientists measure it as a deviation from average rainfall. They use the previous 30 years of rainfall to create the average. Scientists measure drought with the Palmer Drought Severity Index. Normal climate conditions vary between +0.5 (wet) to -0.5 (dry). Readings below -0.4 indicate drought. Readings below -0.6 are rare. Drought is most people's biggest climate change worry. A Pew Research Study found that 50% of Americans said drought is the effect that concerns them most. In 2012, more than 80% of the United States experienced abnormally dry conditions. How does climate change create more severe droughts? It’s a vicious cycle. Greenhouse gas emissions trap heat, causing air temperatures to increase. The hot air absorbs more moisture, resulting in less rain. Hotter air also increases evaporation from lakes and rivers, reducing water sources. Reduced rainfall kills the plants that normally retain moisture in the soil, leading to even drier conditions. Unfortunately, droughts also increase the likelihood more extreme weather. When it does rain, water just runs off without absorbing into the water table. Since the drought killed plants, there are no roots to retain the rainfall. This runoff creates larger and more frequent floods. Dead vegetation, warmer air, and decreased rainfall also increase the frequency and severity of wildfires. The Colorado River basin stretches from Wyoming to Mexico. It provides water for 40 million people and 5 million acres of farmland from Wyoming to California and Mexico. The past 19 years has been the driest period in the past 1,200 years.One recent study estimated that global warming will lower the river’s flow by another 35% by 2100. The river feeds into Lake Powell on the Utah and Arizona border and then Lake Mead in Nevada. Lake Powell is only 48% full and Lake Mead is 38% full. In early March, the water level in Lake Mead had dropped to 1,088 feet above sea level. When the level drops to 1,075 feet above sea level, it triggers federal mandatory water restrictions. If it drops below 950 feet the water could no longer turn the dam’s hydroelectric turbines. At 895 feet, the lake reaches “deadpool” status and no water could flow out. On March 19, 2019, the seven states that depend on the river agreed to a Drought Contingency Plan. It cuts off water to some farmers in 2020, forcing them to pump limited groundwater. They should shift to less thirsty crops than cotton and alfalfa. Farming uses 74% of the water in Arizona. Many other long-term measures are not even being considered. But Arizona's Groundwater Management Act has already outlawed irrigation on new farmland and required builders to show a 100-year water supply. California's Central Coast experienced drought conditions for 30% of the past two decades. That's twice as much as during the prior 100 years, according to a 2015 Stanford study found. Snowmelt from the Sierra Nevadas has become harder to count on thanks to global warming. As a result, farmers are draining aquifers, many of which aren’t recharging due to a shortened rainy season. From 2011 to 2016, California experienced its worst drought since 1850. High air pressure off the West Coast diverted typical winter storms. The NOAA Drought Task Force said climate change did not cause the drought, but it did create the high temperatures that worsened it. The drought ended with rainstorms in February 2017. Southern California's drought reappeared in 2018, leading to massive wildfires. California produces two-thirds of the nations' fruits and nuts, and a third of its vegetables. The state produces all U.S.-grown almonds, artichokes, lemons, and pistachios. It's the world’s fifth-largest supplier of food. The soil and climate are ideal, but the water supply is not. Irrigation uses 41% of the state's water supply. In 2014, irrigation costs resulted in higher prices for fresh fruits, vegetables, and nuts. Fruit prices rose 4.8%. The California drought cost the state an estimated $2.2 billion in 2016. Almost 17,000 farmers lost their jobs in 2014. A 2017 study found that drought and other climate change impacts will make half of California's Central Valley no longer suitable for growing crops like apricots, peaches, plums and walnuts by 2150. That will grow to 90% by 2100. In 2012, the central Great Plains suffered the worst drought since 1895. It was worse than the driest summers of the 1930s Dust Bowl. It added to the 2010-11 drought suffered by the southern Great Plains. Air currents failed to bring seasonal moisture from the Gulf of Mexico. The dry air created record heat waves. Corn yields were down 26%, almost as bad as in the 1930s. The U.S. Department of Agriculture declared a natural disaster for over 2,245 counties covering 71% of the country. The U.S. Army Corps of Engineers had to deepen a portion of the Mississippi River by two feet. The drought had reduced the water level so much there was no longer the required nine-foot clearance. The drought withered crops in the field. As a result, farmers had to slaughter cattle that had become too expensive to feed. By 2013, beef and veal prices rose 2.0%. Fresh vegetables rose 4.7%. In 2014, drought in the Midwest drove up beef prices 12.1%. In 2015, beef and veal prices rose 7.2% due to a drought in Texas and Oklahoma. The Dust Bowl drought hit the Midwest in the 1930s. It was caused by shifting weather patterns over both oceans. The Pacific grew cooler while the Atlantic became warmer. This combination changed the direction of the jet stream. This wind current usually carries moisture from the Gulf of Mexico to the Great Plains, dumping rain when it reaches the Rockies. When the jet stream moved south, rain never reached the Great Plains. Widespread farming practices turned the drought into the Dust Bowl. Farmers plowed over 5.2 million acres of the deep-rooted, drought-resistant prairie grasses that used to hold moisture in the soil. When the drought killed farmers' shallow-rooted crops, high winds blew the topsoil away. Dirt fell on everything, even covering houses. It suffocated livestock and gave children pneumonia. Winds blew dust all the way to Washington, D.C. The drought and dust destroyed a large part of U.S. agricultural production. Some parts of the Midwest still haven't recovered. The Dust Bowl made the Great Depression even worse. The Dust Bowl could happen again. Agribusiness is draining the groundwater from the Ogallala Aquifer eight times faster than rain is putting it back. The Aquifer stretches from South Dakota to Texas. It supplies 30% of the nation's irrigation water. At the current rate of use, it will dry up within the century. Parts of the Texas Panhandle are already running dry. Scientists say it would take 6,000 years for the rain to refill the aquifer. The area is home to a $20-billion-a-year industry that grows one-fifth of U.S. wheat, corn, and beef cattle. Ironically, farm subsides are partly responsible for draining the Ogallala Aquifer. They were part of the New Deal that helped small farmers stay on the land. Now, they pay the farms that are depleting this water supply. Corn for cattle feed is the most significant culprit, fattening 40% of the nation's grain-fed beef. Cotton growers in Texas receive $3 billion a year in federal subsidies. They drain water from the Aquifer to grow cotton that's shipped to China, where it's made into the cheap clothing sold in American stores. 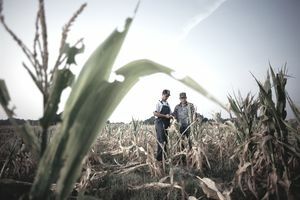 Other subsidies encourage farmers to grow corn for ethanol biofuel. The number of ethanol production facilities in the High Plains region has doubled. In response, farmers are increasing corn production, draining an additional 120 billion gallons a year. Thanks to rising temperatures, shorter winters, and longer summers, western US wildfire frequency has increased by 400% since 1970. Damaging wildfires have occurred in recent years in places like California, Colorado, Arizona, and New Mexico. One recent NASA study revealed that a drought that’s been affecting the eastern Mediterranean Levant region since 1998 is likely the worst in the past 900 years. From 2006 to 2011, Syria suffered from an extreme drought that climate change made worse. It displaced 2 million Syrians as farmers moved to the cities. It helped to create the civil war and sent thousands migrating to Europe. A Columbia University study found that drought doubles the risk of a low-level conflict escalating to a civil war the following year. By 2050, there may be more than 700 million climate refugees on the move. Northern Africa and the Sahel, a band of farmland south of the Sahara, are also experiencing drought. The Sahara desert is expanding southward into Sudan and Chad. Refugees from those regions are close on the heels of Syrian and Afghan migrants into Europe. Drought threatens the 8.8 million residents of Mexico City, Mexico. The city pumps drinking water from underground aquifers. That drains the water table. The portions of the city that rest on clay sink as the water table falls. Many areas of the city must rely on water trucked in from elsewhere. One study predicts that by 2080 the city’s average temperature will have risen several degrees. Annual rainfall will have decreased by 20%. As a result, drought, floods, and rising temperatures could send 10% of Mexican adults north. Climate change is threatening coffee plantations from Uganda to El Salvador to Vietnam. It threatens the $19-billion-a-year industry and the 125 million people who depend on it. In 2014, drought in Guatemala created the conditions for coffee rust. This fungus thrives in higher temperatures, which also weaken plants like coffee shrubs. The area lost 50 to 90% of its crops. U.S. coffee prices rose 33% between 2011 and 2013. As a result, 3.5 million people required the United Nation's humanitarian aid. Between October 2015 and September 2016, U.S. Customs and Border Patrol apprehended 75,000 Guatemalans. In 2010, the Patrol stopped just 17,000. The NOAA publishes a short-term drought outlook. It predicts the U.S. drought conditions for the next month and season. If climate change isn't arrested, the United States will be much drier by 2030. The Midwest will drop to between -0.2 and -0.4 on the Palmer drought scale. In 80 years, areas of the United States, the Mediterranean, and Africa will experience severe drought, from -0.4 to -0.10 on the scale. By 2050, the American Southwest and Great Plains will experience a megadrought. The drought will last 50 years, according to scientists at Cornell University. It will be similar to droughts that occurred in the region during the 12th and 13th centuries, but it will be entirely man-made, a consequence of global warming. By 2100, America's national parks will be 9 F warmer. Parks are particularly vulnerable to climate change because they are in higher-altitude areas. The glaciers in Montana's Glacier National Park will disappear. Even Florida's Everglades will be 6 F warmer. Alaska's Denali will be hardest hit, with a temperature increase of 16 F. The Arctic is warming at a faster rate than the rest of the nation. Government policies can solve the short-term drought problem. First, reverse subsidy policies that encourage thirsty crops like cotton. Instead, direct subsidies toward crops like prickly pear. Second, promote policies that conserve water. These include waste-water recycling, desert landscaping, and low-flow appliances. In the long-term, the government must stop climate change to solve drought. Nations must limit the amount of greenhouse gases emitted into the Earth's atmosphere. Once that is done, carbon emissions trading can encourage businesses to adhere to the cap. A carbon tax can punish them if they do not.